When we arrived at Hotel Murano at 12:30AM due to flight delays and construction headaches, we expected to snooze through the check in process and scramble our way up to bed. Upon arrival, though, we quickly realized that Hotel Murano is much more than a place to catch some zzzzz's. 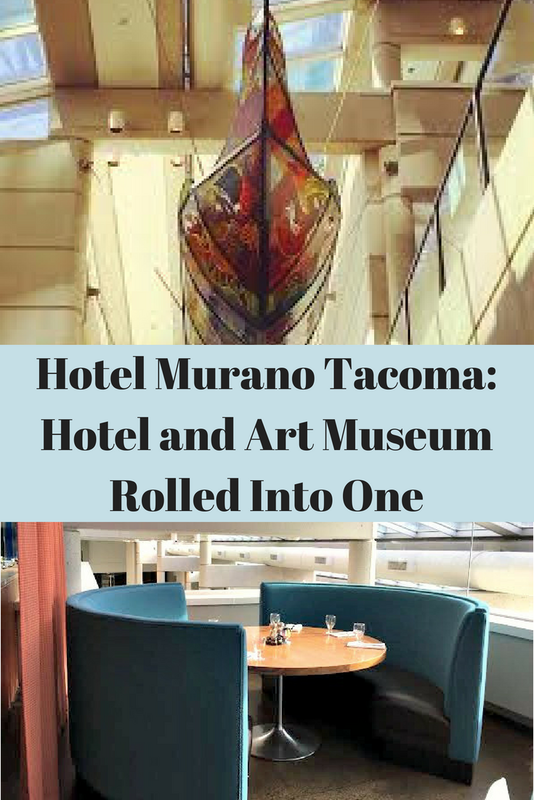 Named for Murano, Italy the famed Old World capital of glass art and existing in Tacoma the glass capital of the Pacific Northwest, it is no wonder that Hotel Murano has emerged as a splendid homage to glasswork! 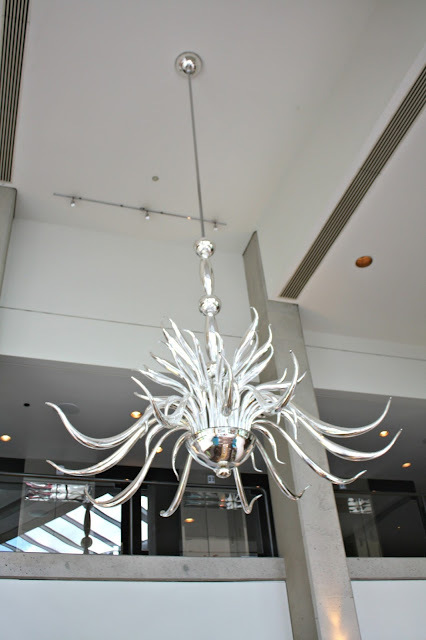 Awe-inspiring glass chandelier in the lobby. Glass masterpieces are discovered throughout the hotel including Massimo Micheluzzi's anemone-like chandelier pictured above. 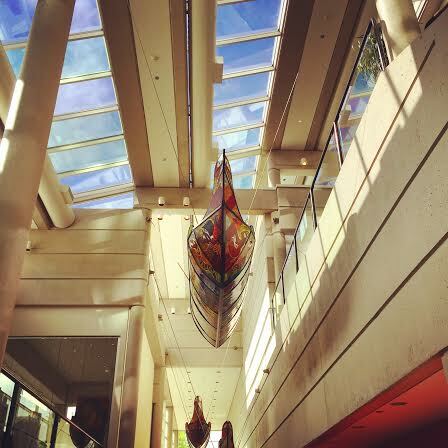 The artwork can be found in the lobby, hallways and on each floor. 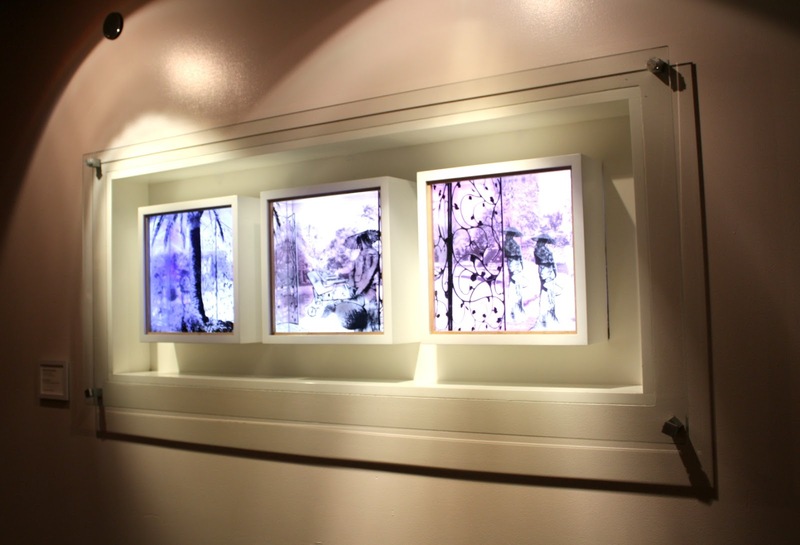 Guests also can find descriptions and more details about some of the artwork alongside the pieces. Docent-led tours can be reserved. Stunning glasswork on every floor. Charming scene depicted in glass. Of course, we did have to rest a bit and found our accommodations quite peaceful. Our room was sophisticated yet comfortable. Our room was situated near the elevator, but we really did not hear the elevator and it was actually quite convenient when coming back and forth from explorations. Mornings can be quite a crunch when traveling yielding to a struggle finding a bite to eat. Fortunately, Hotel Murano houses a pleasant little restaurant called Bite. 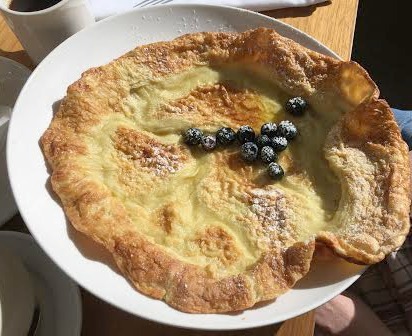 We enjoyed breakfast twice at Bite and would not hesitate to come back. With glorious windows letting the sun come in, the restaurant is quite jovial in the morning. The menu carries a decent range and everyone should find something on it. If not, the restaurant also carries a collection of snack options like bars and muffins. 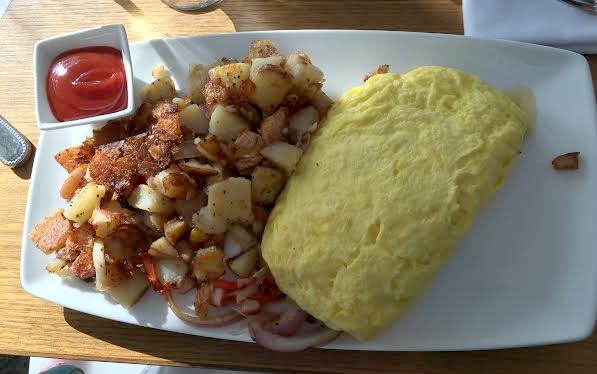 Among the options we enjoyed were omelettes, german pancakes (a house specialty) and breakfast potatoes. I am always concerned about getting enough fruits and vegetables on the road but that was not an issue here. Phew! All three of us enjoyed our meals! 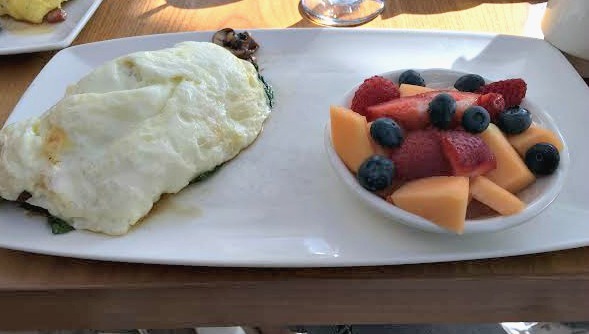 Egg white omelette with spinach and mushrooms. While service was fairly quick, we found Bite to be a nice place to relax. Of course, I spent time enjoying my tea! 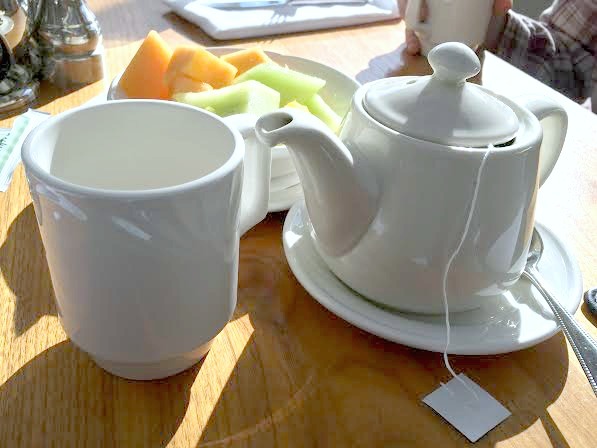 A pot of tea to start the morning! Hotel Murano is located within walking distance of Tacoma's Museum District. For a family fun adventure, you cannot ask for a better location. 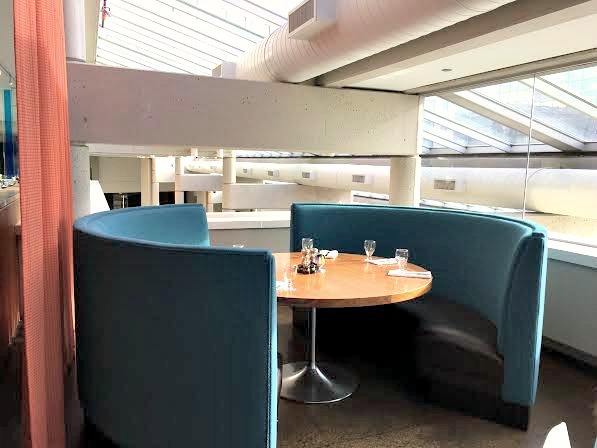 Relaxing accommodations, an intriguing atmosphere, a nice spot for a bite---we love Hotel Murano and would love to stay again! Creative Forces is a lovely little store within Hotel Murano that sells artwork from over 40 local artists. You will find quite a range there, so an excellent place to stop in for a memento of your Tacoma visit. Hotel Murano is very pet friendly and even will find a pet bed by West Paw Design in their room along with other amenities including pet room service! **Disclosure: We did receive complimentary meals at Bite and a special rate at Hotel Murano. No other compensation was received and all opinions are 100% my own. Thank to Travel Tacoma with helping arrange our visit!